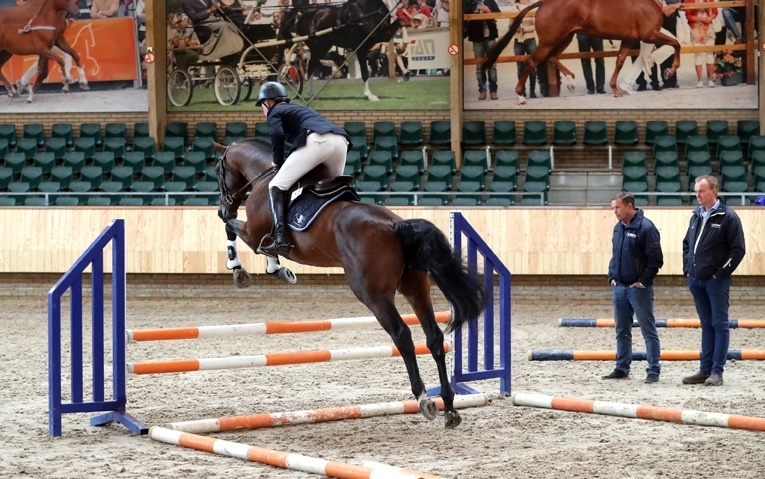 After a saddle presentation under the regular rider and veterinary inspection, ten jumper stallions have taken residence in a stable at the KWPN center in Ermelo. Three stallions can be presented again next week. Last Monday, 14 stallions were presented, after which the owners of Kwik van de Zietfort (s.F-One USA) decided to withdraw the stallion. In general, the stallions were well trainable, one stallion participates on a voluntary basis in the performance test. Two stallions may be presented again next Tuesday to the veterinary surgeon, this concerns Key West (s.Tangelo van de Zuuthoeve) and Karaat ES (s.Falaise de Muze). "Both stallions were put on new shoes shortly beforehand and presumably they were a bit bothered by that. We look forward to seeing them again next week ", says committee chairman Cor Loeffen. Kosmo ES (s.Comme Il Faut), which was entered for a voluntary test, can also be shown again to the vet next week. Also the five-year-old Cascadello Boy (Cascadello from Baloudora by Balou du Rouet, breeder: A. Schulze-Averdiek) from Syndicate Rheinmaas started the performance test. For him 21 days are enough. "We let him consciously run his three-week test at the start of the testing period, so that he - if he was approved - can be prepared for the stallion competition again by his own rider," adds Wim Versteeg.